What Should I Include In My Followup Sequence After The Quiz? 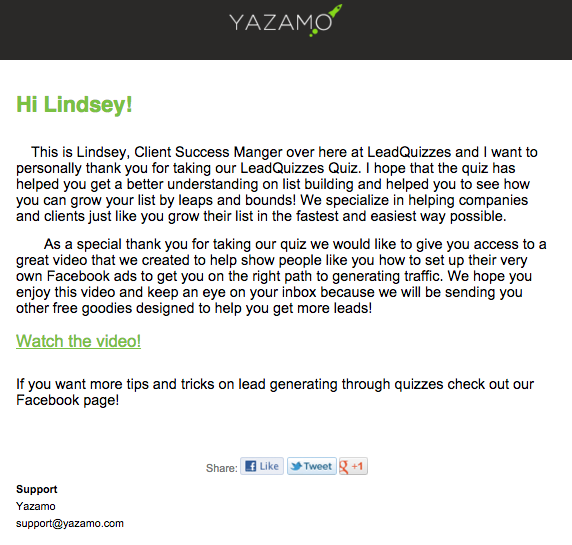 After every quiz there should be some sort of followup and one of the best ways is with an email auto responder! An E-mail follow up sequence or auto responder is a series of pre-written emails that are set up in advance and are sent to your quiz taker immediately after they opt in to be apart of your email list.Your follow up sequence is how you will take fresh hot leads and turn them into loyal clients who just can’t wait to get their hands on your next offer. A followup sequence is highly recommended to further connect with your quiz taker by linking your quiz to your specific products and services. E-mail followups can vary from business to business, but typically they include at least 4 different emails. An example of a basic 4 email follow up sequence can be found below! 1. Thank You: This first email in your auto responder, the thank you email, should go out as soon as an opt in hits your list that way they remember who you are and that they took your quiz. In this email you will also want to provide them with a bit of free content to “butter them up” and show them that you really care about them and not just getting a sale! Take a look at our answer below. 2. Introducing you and your company: The next email you want to send out should introduce you or your company and what your mission is. 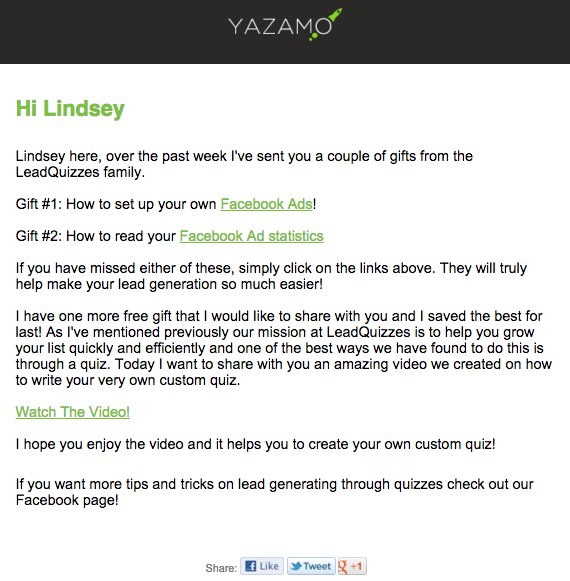 In this email you will also want to add some free content as a thank you for being such a great follower. Take a look at our example below! 4. Going back to offer after the quiz: In the fourth e-mail, you will want to mention why they took your quiz because they recognized that they had a problem or that they were interested in your services. You will want to remind them how great your services are and how you can help to solve their problem! 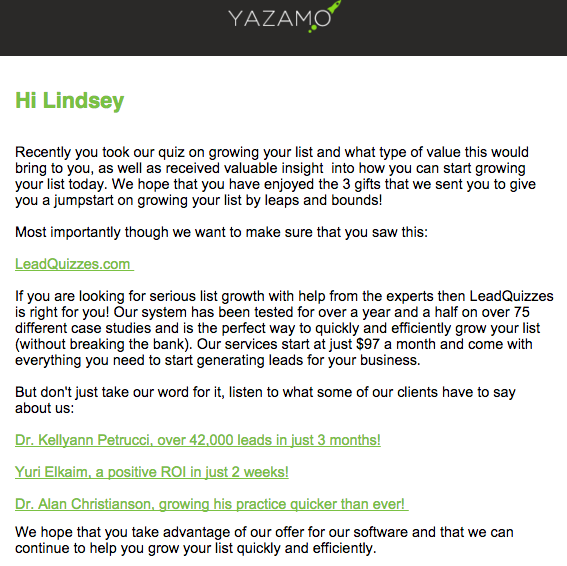 After this forth email you can send leads to your regular list (maybe where you send out your monthly newsletter) or put them through a longer follow up/nurture sequence. Here are some tips for making sure your emails get opened and things you can be testing! People love pictures, we see them all the time with Facebook, Instagram, Pintrest, etc. add pictures to your emails to easily get your message across to your readers and further provide branding of your business. Relative, quality email material that stays on the topic of your business increases your credibility. With so many imposters on the internet, you want to show your quiz takers why your product specifically will better their daily life. This will make your products and services easier to sell as well. Provide your audience with up to date news about your business or industry. By educating and informing your clients on whats going on, you enable them to see the value of your new goods or services. Sometimes adding fun facts about yourself such as hobbies, children, pets, fun vacations you took can all help your audience connect with you. If they like you, chances are they will like your product. They say "Doing the same thing over and over again and expecting the same results" is the definition of insanity, there for if you want different results try changing up the styles of your e-mails. Get different ideas by subscribing to various email news letters, examine their style and see what they are doing before determining what works best for you. If you have questions on how to setup your follow up sequence in your specific email software be sure to check out our helpful guide on “How To Setup Auto Responders”. You can find this document by going to the Help & Support link on the top right hand side of your screen within LeadQuizzes. 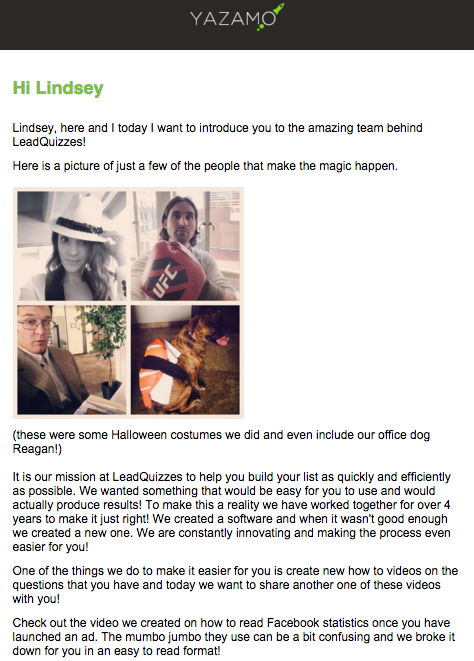 Also keep in mind that as a member of the LeadQuizzes family you have access to the 100K Email Mastermind group on Facebook and you can always ask other group members what they are doing for their follow up sequence and what suggestions they might have to help make yours amazing!